Poker Omaha – game rules. 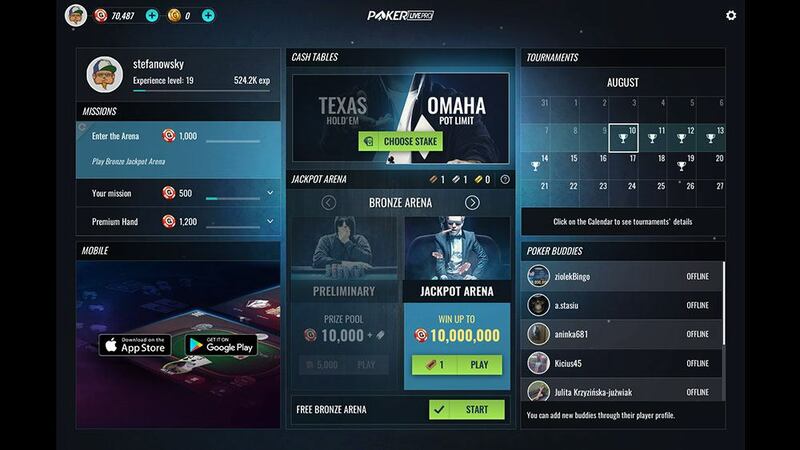 User interface – see how to play Poker Omaha on GameDesire! Twice the cards, twice the action! The welcome window is divided into separate sections. The middle part shows ‘Ring games’ and ‘Tournaments’. Below there is a player panel and more detailed information about available Tournaments. The bottom part of the screen provides fast access to friends’ profiles and propositions. In the left corner of the screen there is a coin-like button which allows you to buy more GameChips. The right upper corner contains tabs which help navigate between tables and the ‘Main Lobby’. The upper bars are visible throughout the game. The bottom left of the screen contains information about the current Jackpot. On the right there is information about the amount of available GameChips. In this section, using the plus / minus selector, the player can choose the game stakes. Changes in stakes will also display number of available tables for each stake. Choosing the yellow ‘Play Now’ button will automatically open a table with the selected stake and place the player in an available seat. There is also the possibility to choose a table manually, choosing the green button ‘Main Lobby’. In the main tournaments section, each individual tournament contains the following details: buy-in, prize pool, number of players registered and time left to start. The yellow ‘Join’ button will register you to the chosen tournament. Just below, there are two additional buttons: ‘Tournaments’, which opens the Tournaments Lobby, and ‘Room List’. Choosing ‘Room List’ allows you to manually open any available game room. Next to the room's name the number of players and available tables are displayed. This section allows you to check a player's experience level, amount of GameChips and number of hands played. Click on an avatar to open a mini-profile. Achievements with grey icons are those you can get in the future. Click the ‘More’ button to get detailed descriptions of all Achievements. This window is divided in two separate sections. The upper section allows you to move between tables with chosen criteria (game stakes, table size) as well as to open a game which matches that criteria. 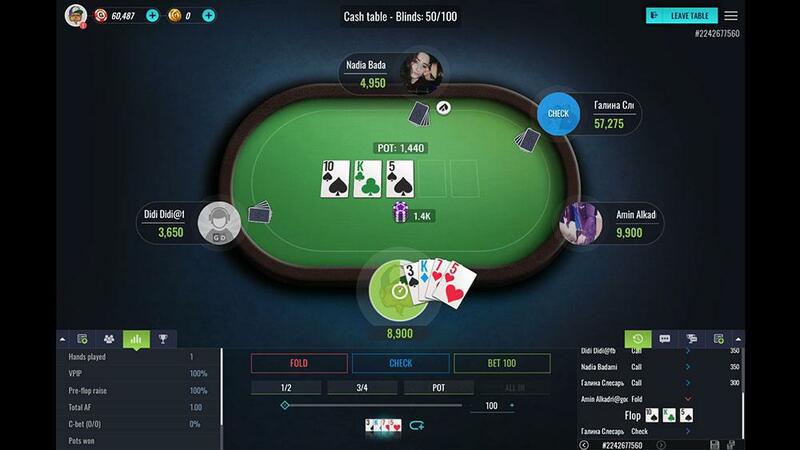 The bottom section contains a chat window and full tables list with more detailed information about game stakes, number of players and average pot. The ‘Play Now’ button allows you to enter a table according to your chosen criteria. The other way to start a game is to use the ‘Sit Down’ option from the list of tables at the bottom. The upper section allows you to review poker tournaments by a selected criteria (i.e. type, buy-in) and to join the tournament which matches your selection. The bottom of the screen contains a chat window, a list of the player’s registered tournaments and full list of available tournaments with details about buy-in, status and number of players. Next to the list there is detailed information about the chosen tournament. In the upper part of the screen, players have the option to browse ‘Hands History’ and additional options. The lower part is divided into sections containing ‘Chat’, ‘Players at the table’ and ‘Betting options’. In the upper left corner of the screen the current hand number is listed along with a detailed history of the last hand. The upper right corner of the screen provides access to the following options: ‘screenshot tool’, ‘table statistics’, ‘view table change’, ‘sound controls’ and ‘exit from game’. In the bottom right part of the table, a section with betting options is visible. 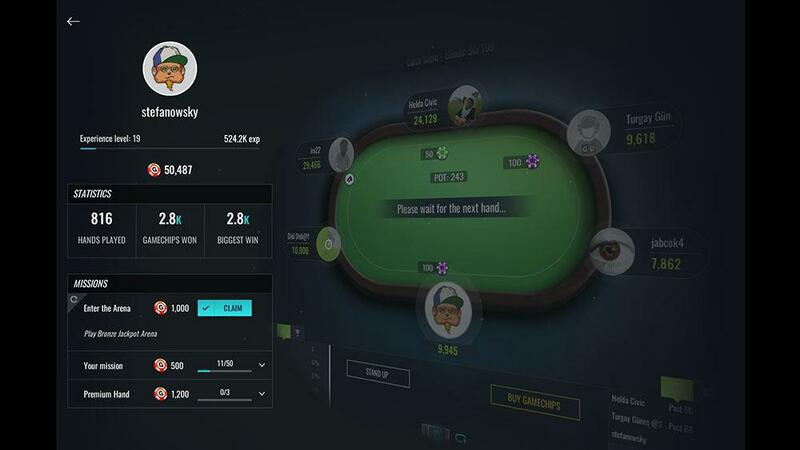 During the game, just above the betting options, players can see system messages showing their best possible hand. 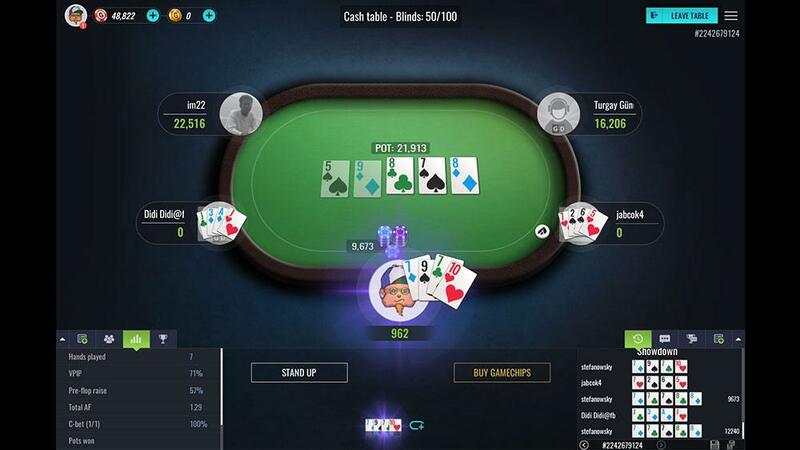 This window allows you to browse the list of players who are currently at the table and shows details such as experience level, account status, nationality and amount of GameChips. Clicking on the icon next to the players' nickname will open a context menu showing the following options: private chat, add the chosen player to your list of friends, ignore players and mini-profile. Messages written by players are visible along with system messages. Private chat with other players is available. Next to every player message there is a gray arrow icon changing the color to green when the mouse cursor hovers over it. Clicking this icon will open a context menu that gives the following options: private chat conversation with the chosen player, adding them to your list of friends, adding them to your list of ‘ignored’ players or displaying their mini-profile. Using the graphic icons, players can build their own custom emoticon, which will be visible for others while using chat.